Beautiful Holiday Lake Estates home in an excellent location with views. Imagine waking up & enjoying coffee in bed while looking out the patio door to the lake! Large master suite includes a walk-in closet complete with built in cabinets. Custom master bath is remodeled with natural marble from Italy. 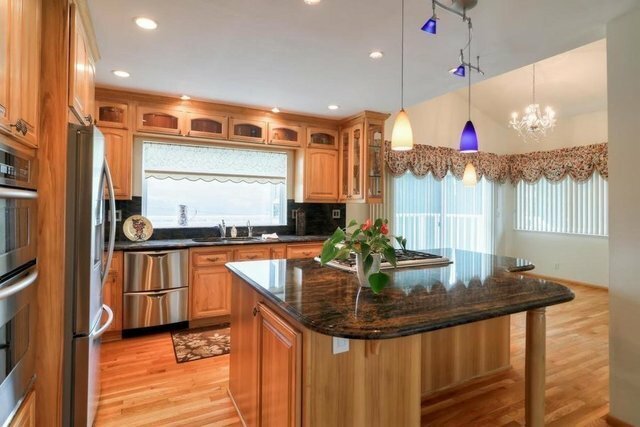 Gourmet kitchen boasts views to the lake & mountains & features Hickory cabinets w/interior lighting, natural stone from Brazil, large island with downdraft 5 burner Thermador gas stove, 2 drawer Fisher-Paykal dishwasher, trash compactor, wine cabinet & Ultima high speed microwave. This area features a built in bar & an EPA approved fireplace insert, w/natural slate from India. Above the family room is a loft currently being used as an office/library. The formal living room also looks out to the backyard & the lake/mountains. Entertain in the serene & private backyard with pool & spa. Mud room & full bath adjacent to the pool. Short 40 min drive to SJ Int. Airport! 8.9 KW solar is owned.